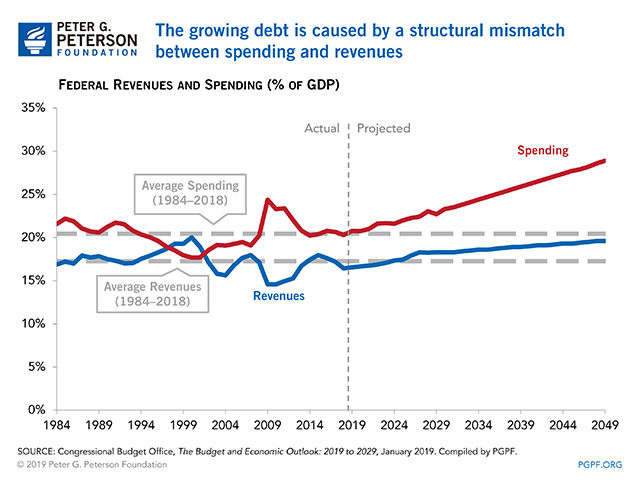 Today, the non-partisan Congressional Budget Office (CBO) released its Budget and Economic Outlook for 2019 to 2029 — illustrating the fiscal challenges that we face in the coming decade. CBO’s data continues to show that we’re on a troubling fiscal path. 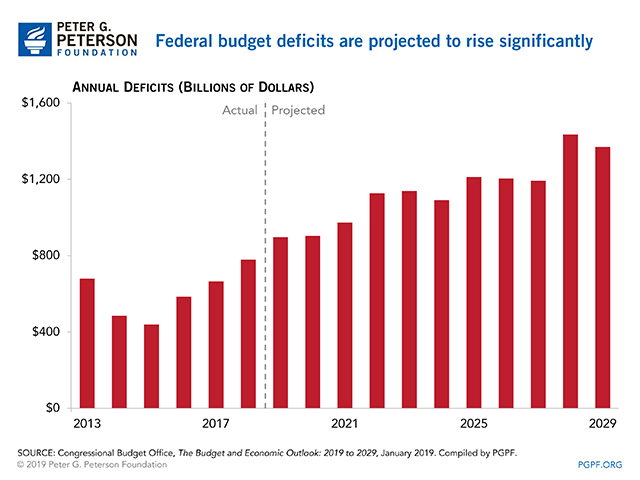 Despite a growing economy and low unemployment, federal budget deficits are projected to grow over the next 10 years — a highly unusual pattern. 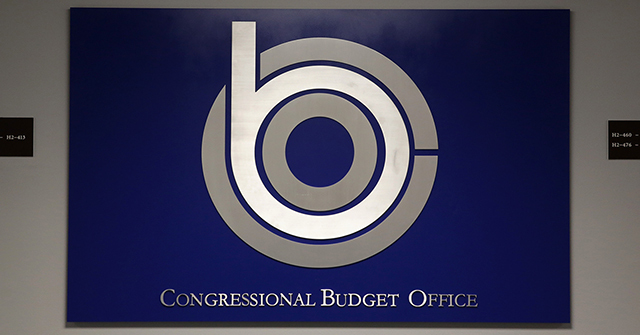 CBO projects that annual budget deficits will climb from about $900 billion in 2019 to $1.4 trillion in 2029. Larger annual budget deficits will lead to a rising national debt — which is already at its highest level since 1950. 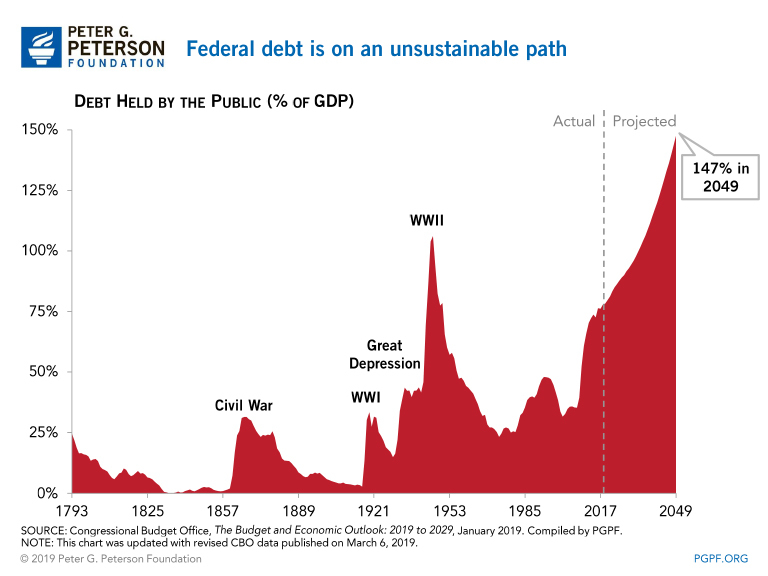 Under current law, the national debt is expected to climb to *147 percent of GDP by 2049. The growth in our national debt is the result of a structural mismatch between revenues and spending. Under current law, the growth in spending — driven primarily by an aging population, rising healthcare costs, and higher net interest costs — will drastically outpace revenue growth. 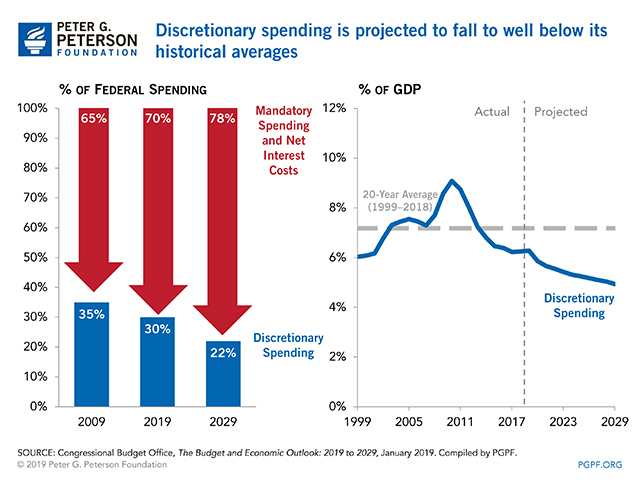 While total spending is projected to climb considerably over the next several years, discretionary spending is expected to decline relative to the size of the economy. By 2029, discretionary spending is projected to fall to 4.9 percent of GDP — below its 20-year historical average of 7.2 percent of GDP — and will only make up 22 percent of federal spending. 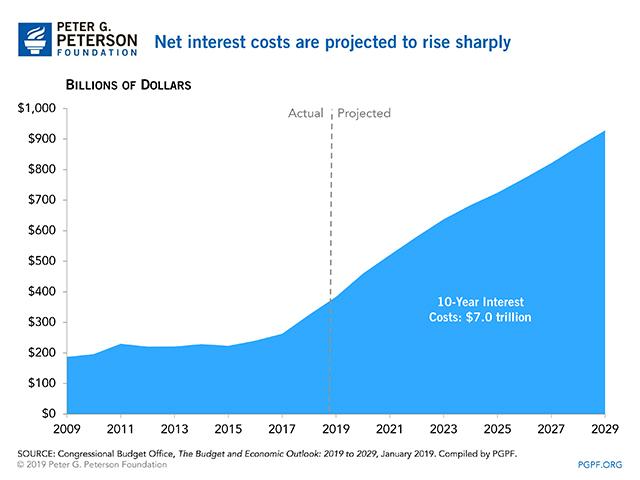 The fastest growing component of the budget, net interest costs are projected to more than double over the next decade, rising from $383 billion in 2019 to $928 billion in 2029. We will soon be spending more on net interest costs than we do in other essential areas such as Medicaid and Defense. Rising deficits and debt put us on an unsustainable path, but it’s not too late to change course. There are a number of options and bipartisan solutions to stabilize the national debt and get us back on the right track.